The Enquiring Light at the Queen Victoria Art Gallery. 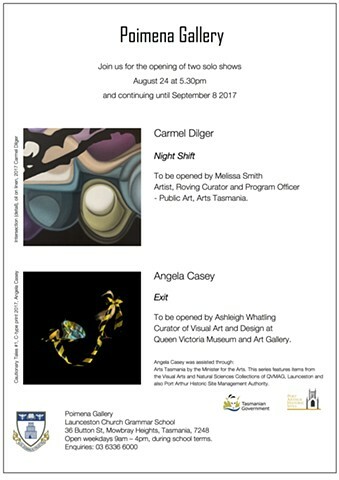 A survey show of Angela Casey's photographic works. Queen Victoria Art Gallery at Royal Park, Launceston, Tasmania. Check out my Pozible campaign! 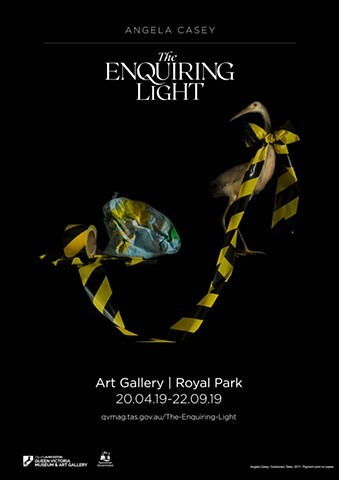 The proceeds will contribute towards production costs for a major survey show of my photographic work at Queen Victoria Museum and Art Gallery, "The Enquiring Light" which opens in April this year. Your support with pledges starting at $2 will be greatly appreciated, every drop is valuable. If you pledge $60 or more you will receive an artwork as a thank you. Please visit my campaign site, lots of artworks to choose from. If you are feeling adventurous, then why not have a work of art created for you? I can create a still life photograph image for you! I am sure you have some favourite possessions in your life, how about capturing them in a work of art to hang on your wall. Please click the link for more details! 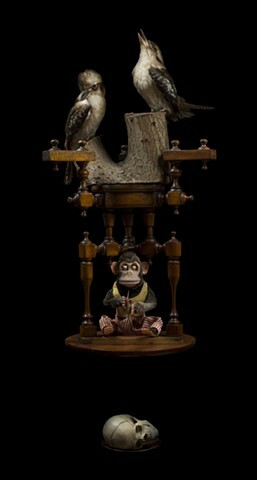 Place a bid on "Cautionary Tales No.1" 2/5, auction on 15 June 2018, Sydney, NSW. QV Magazine cover and feature article. Don't forget to pick up a copy of the latest Queen Victoria Museum and Art Gallery Magazine: QV. 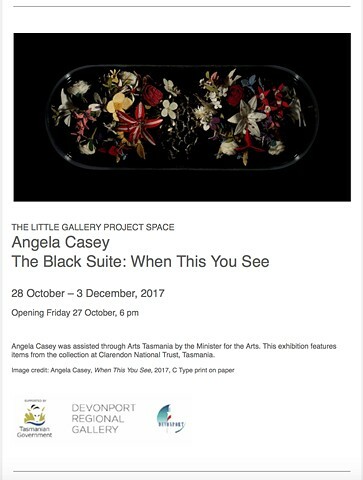 "The Black Suite: The Cautionary Tales of Angela Casey". 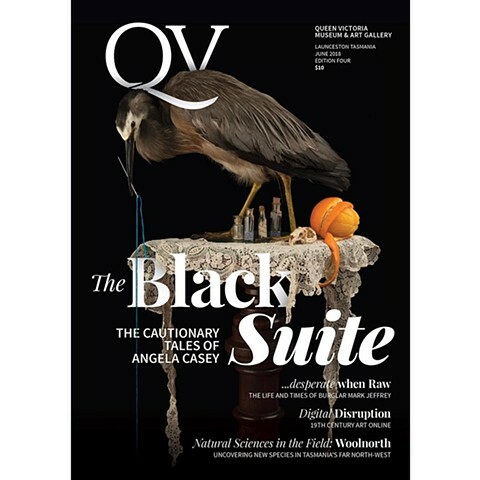 The next issue of Queen Victoria Museum and Art Gallery's QV4 magazine will hit the stands in June. Finalist - The Hutchins Australian Contemporary Art Prize 2018. "Mirror" 2018, has been announced as a finalist in The Hutchins Australian Contemporary Art Prize 2018. The show will coincide with Dark Mofo and will be at The Brooke St Pier, Hobart, Tasmania. 9 - 27 June 2018. Workshop: Still Framed (Studio Photography) with Angela Casey. 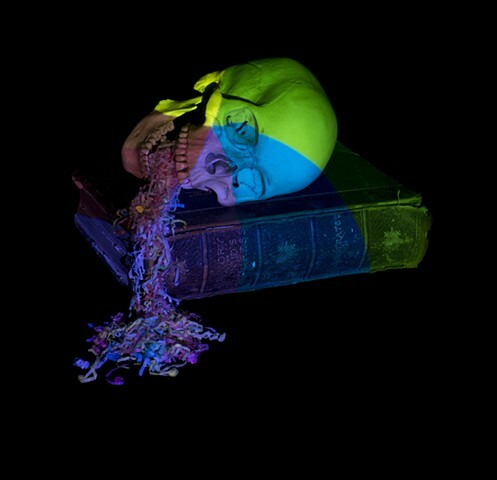 Develop your skills in digital still life photography with artist Angela Casey. 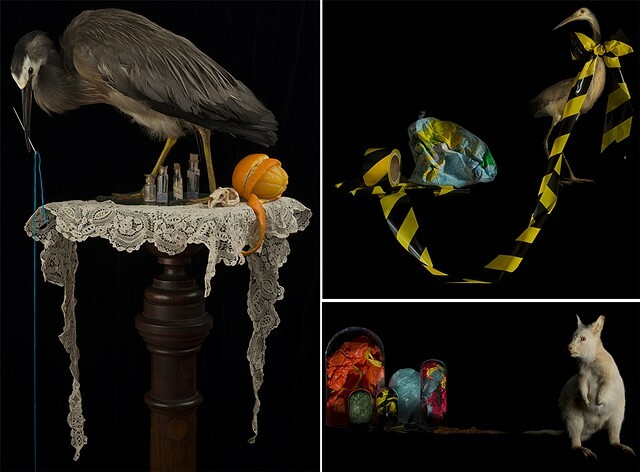 Learn about the history and symbolism of the 16th century Dutch Vanitas painting tradition and explore how to interpret it in a contemporary context with photography. The Gallery will be transformed into a photographic studio for participants to explore still life photography, composition and lighting. Perfect for anyone wishing to enhance their photographic skills in an area used so often in business marketing and social media. You are welcome to bring your own camera or camera phone and a couple of objects you wish to include in your photographs, or use the items and digital cameras provided. All materials provided. Optional: BYO digital camera. Join me for the opening of my next solo show at Devonport Regional Gallery on Friday 3 November at 6pm. The show continues until 3 December 2017. 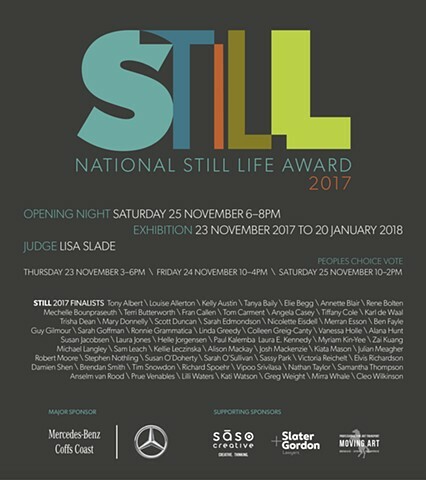 I excited to be finalist in Still: National Still Life Award 2017. I am very pleased to be announced as a finalist in the 2017 Fisher's Ghost Art Award. The winner will be announced on Friday 3 November at 6pm. The exhibition will be held from 28 October - 14 December at the Campbelltown Arts Centre, NSW. 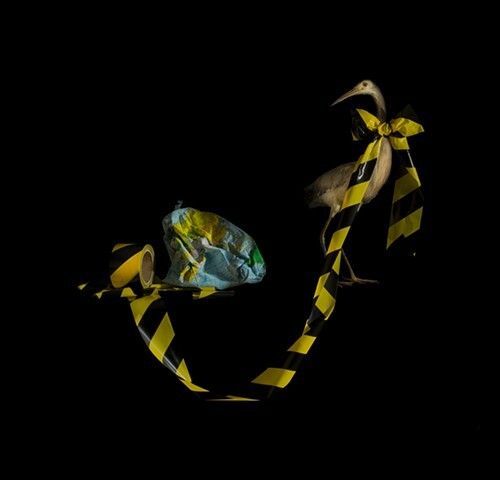 Birds feature as surrogates for human presence in the exploration of the tension between the global environment and the human condition during tenancy in this world of noise. Black is the colour of silence, providing a quiet envelope for the contemplation of the narrative. 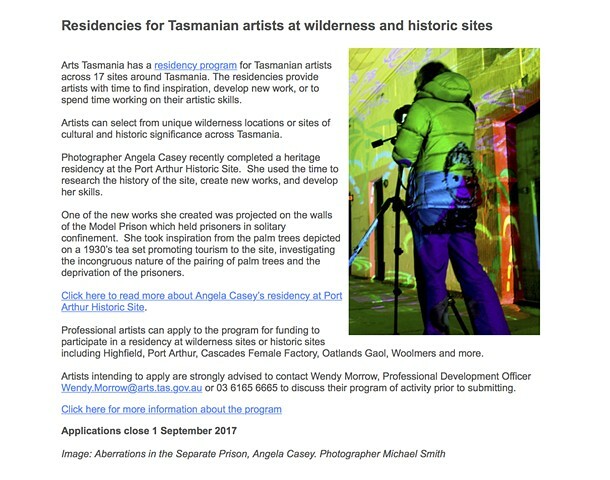 Residencies during 2017 at Queen Victoria Museum and Art Gallery and Port Arthur Historic Site Management Authority with the assistance of Arts Tasmania have resulted in work which will feature in two solo shows this year at Poimena Gallery and Devonport Regional Gallery. 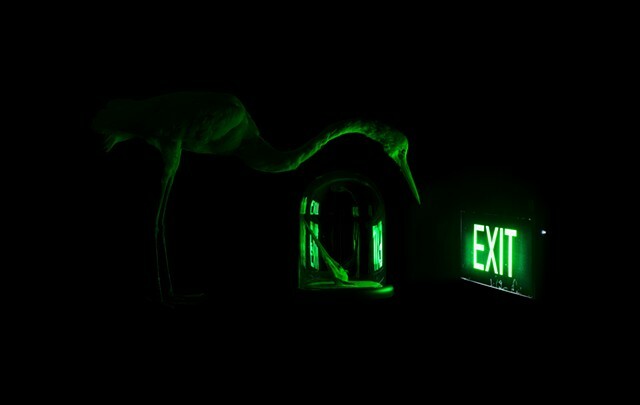 The native and endemic birds of Tasmania feature as surrogates for the human occupation in Exit which explores the state of the human condition during tenancy in this world and the residual presence that remains thereafter. Black is the colour of silence, providing a quiet envelope for the contemplation of the narrative within this world of noise. Arts Tasmania by the Minister for the Arts. 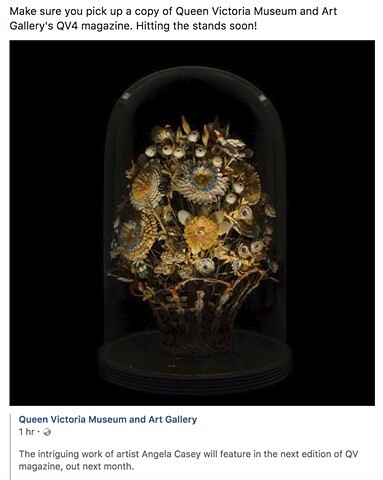 This series features items from the Visual Arts and Natural Sciences Collections of QVMAG, Launceston and also Port Arthur Historic Site Management Authority. The hedonism of contemporary life depicted as the drive through meal and the four litre cask disguised as something more luxurious. Our attention is diverted from industry’s insatiable hunger which will push us as a society ever forward in search for new resources, which will one day be just out of reach and outside of comfort. The halo is a discarded remnant of industry, made from Athrotaxis Selaginoides (commonly known as King Billy pine), an endemic Tasmanian tree species. Once abundant, it is now listed as vulnerable and has declined 40% over the last 200 years. For further reading click on the Links page in the main menu. 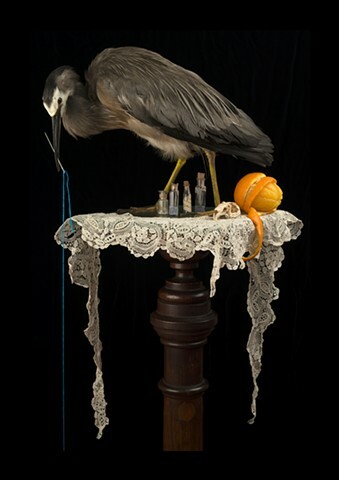 Hedonism Has Run Out of Credit has bee selected as a finalist in The 2016 Brisbane Art Prize. Judith Wright Centre of Contemporary Arts, Fortitude Valley, 15 -21 August 2016. 2016 Flanagan Art Prize finalist. 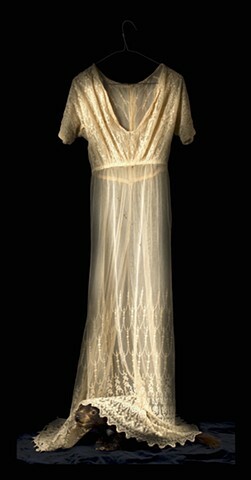 A Gown for Betsheb has been selected as a finalist in the 2016 Flanagan Art Prize. The show will be open 20-28 August at St Patrick's College, Ballarat, Victoria. 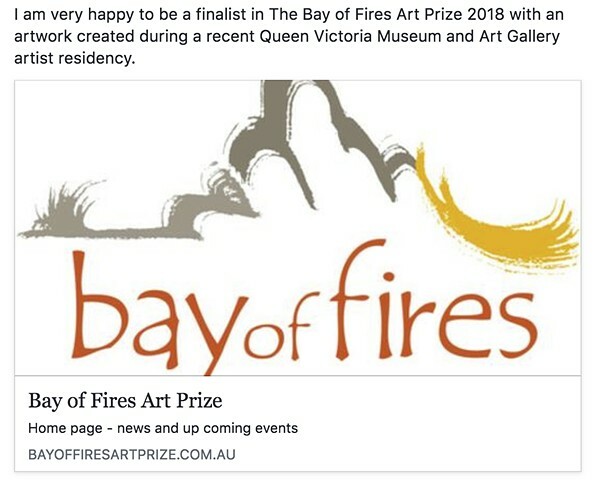 The Observers has been selected as a finalist in the Bay of Fires Art Prize 2016. The exhibition continues until July 2 2016. "The Surgeon" is a finalist in The Blake Prize 2016. The exhibition will be at Casula Powerhouse Arts Centre, Casula, NSW. Launch: on 12 February 2016. A collected exploration of recent personal nostalgia. Ross Byers, Joel Crosswell, Angela Casey, Mae Finlayson, Ray Harris & Celeste Aldahn, Laura Hindmarsh, Angela Leech, Patrick Sutczak, Abigayle Tett and Heidi Yardley. Poimena Gallery, Button Street, Mowbray, Tasmania. Opening night September 5 2014, at 6pm. Photography by Angela Casey, Dean Hohn, Jennifer Dickens & Kitty Taylor. 30 November at 12:00, Ross Byers, Angela Casey and Andrew Weedon (model for 'The Passage') will be at the Gallery to discuss the artworks, inspiration and the production processes involved. 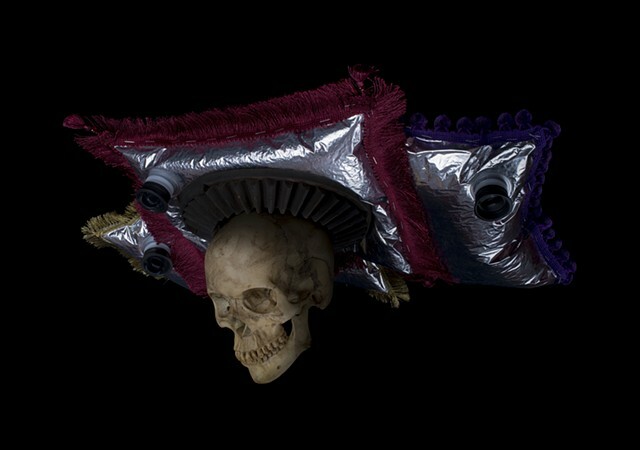 This will include the construction of large scale cardboard sculpture, small metal and papier mache techniques and photographic process. questions will be welcomed. A solo exhibition of Photographs. 29 November - 21 December 2013. Opening night 29 November at 6pm. Level 2, 160 Cimitiere Street, Launceston, Tasmania, Australia.